What’s great with this book is how delightful a character the titular protagonist is. Dayoung Johannson (real name) is a really fun-spirited character and Montclare pretty much perfectly echoes her youthful enthusiasm and energy, which is important since she is a smart 15-year old trained to be a law enforcer and she’s driven by a little bit of idealism as well. That’s probably the most important aspect of the comic. Montclare juxtaposes her story by showing us her past (a few days ago in 2013) against her present (right now in 1986) and we really get a good sense of who she is and what she is. 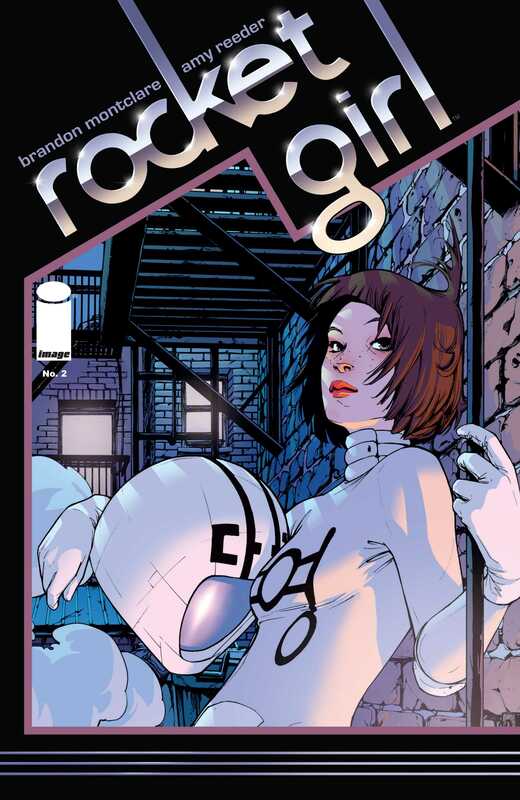 The first issue was a great introduction to the character and now that she is established, the next two issues really delve into her history and her motivations. Montclare builds on all the groundwork that he laid and he expands the universe, most notably by giving us a bigger slice of the entire picture. We learn more about the shady side of Quintum Mechanics’ business practices and the cover-ups initiated by the higher-ups. We learn more about Detective Leshawn O’Patrick for starters, as we follow his arc in the absence of Dayoung from the future-past. We see a really kickass side of Commisioner Gomez, which was something that I didn’t expect. With both these issues, Montclare has done something slightly different. And as great a character that Dayoung is, her supporting cast in both timelines is also good. The characters we see with her in the past-present, the scientists of Quintum who designed the Quintum Engine and got it to work, don’t get a lot of attention, but all the brief flashes we see more than make up for that deficiency. And I love where they are all going. There are lots of mysteries being introduced, and each moment is a highlight. Another thing that’s great to see is that there is also the juxtaposition of the 80s NYPD and the teen cops of the future. Montclare gives us a lot of differences between the two and his characters, especially Dayoung, often comment about that. Its an interesting way to look at things, for sure, because it raises a lot of narrative points. The entire concept of teen cops, and their resultant authority, has me really interested. It was something unexpected and its great to see this develop so. When it comes to the art, Amy Reeder continues to do some great work. I love how she sets up all the differences between the future and past of New York, in keeping with Montclare’s scripts. What I really love about her work are the expressions on her characters’ faces, especially Dayoung. Before reading this comic, I’d never heard of Amy Reeder (not really, other than knowing that she was an artist on DC’s Batwoman until quite recently), and now I want to see more of her work. Just as much as Montclare himself, Reeder is a storyteller here and she reminds the reader of that on every single page. Whether its her panel layouts, her splash pages, the close-ups, the zoom-aways, or whatever, every panel is a fun component of the greater whole. Overall, I have to say that I’m really impressed with both these issues, and that I’d like to see more, definitely for three issues more at the least. 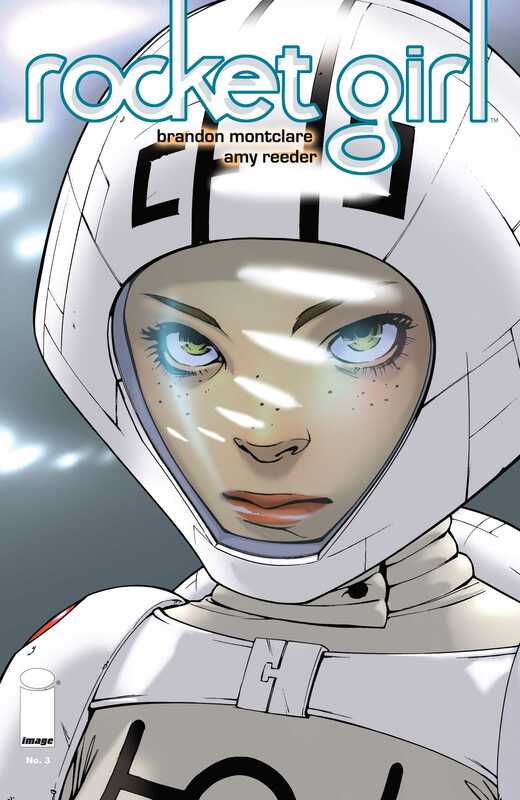 Posted on January 7, 2014, in Comics Reviews, Review Central and tagged Amy Reeder, Brandon Montclare, Comics, Comics Review, Contemporary, Crime, Image Comics, Near Future, New York, Review, Review Central, Rocket Girl, Science Fiction, Teen Cops, Time Travel. Bookmark the permalink. 2 Comments.